"The Last Tuesday Society is responsible for the growing revival of this Victorian whimisical artistic crag since first intro ducting this class from New York in 2009 we have taught literally 100s of novices how to stuff their first mouse, many have gone on to become talented and even professional taxidermists in their own right. 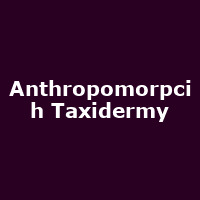 This is an ideal introduction to the craft in which you will be taught all the basic skills of taxidermy - from skinning and preparing to mounting and preserving. Our ancestors, most famously Walter Potter - The Man Who Married Kittens created elaborate and often charming tableau of all sorts of animals in human like poise. Various props (and animals) provided, though please bring your own. The classes are taught by expert taxidermist Tonja Grung".